Astronomers using NASA's Hubble Space Telescope and Chandra X-ray Observatory and telescopes on the ground may have found the most crowded galaxy in our part of the universe. The ultra-compact dwarf galaxy, known as M60-UCD1, may be the densest galaxy near to Earth, packed with an extraordinary number of stars. This galaxy is providing astronomers with clues to its intriguing past and its role in the galactic evolutionary chain. M60-UCD1, estimated to be about 10 billion years old, is near the massive elliptical galaxy NGC 4649, also called M60, about 54 million light years from Earth. It is the most luminous known galaxy of its type and one of the most massive, weighing 200 million times more than our sun, based on observations with the Keck 10-meter telescope in Hawaii. What makes M60-UCD1 so remarkable is that about half of this mass is found within a radius of only about 80 light years. The density of stars is about 15,000 times greater—meaning the stars are about 25 times closer to each other—than in Earth's neighborhood in the Milky Way galaxy. "Traveling from one star to another would be a lot easier in M60-UCD1 than it is in our galaxy, but it would still take hundreds of years using present technology," said Jay Strader of Michigan State University in Lansing. Strader is the lead author of a paper about the research, which was published Sept. 20 in The Astrophysical Journal Letters. "The abundance of heavy elements in this galaxy makes it a fertile environment for planets and, potentially, for life to form," said co-author Anil Seth of the University of Utah. 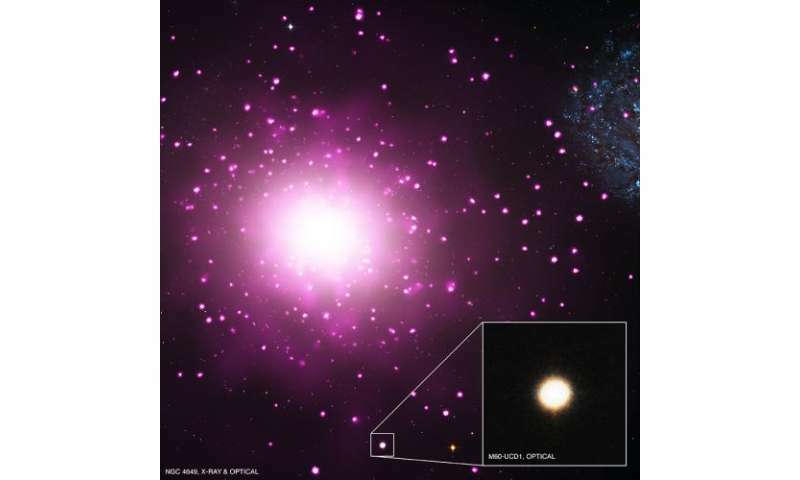 Another intriguing aspect of M60-UCD1 is the presence of a bright X-ray source in its center, revealed in Chandra data. One explanation for this source is a giant black hole weighing in at about 10 million times the mass of our sun. Astronomers want to find out whether M60-UCD1 was born as a jam-packed star clusters or become more compact as stars were ripped away from it. Large black holes are not found in star clusters, so if the X-ray source is in fact due to a massive black hole, it was likely produced by collisions between M60-UCD1 and one or more nearby galaxies. M60-UCD1's great mass and the abundances of elements heavier than hydrogen and helium are also arguments for the theory it is the remnant of a much larger galaxy. If this stripping did occur, then the galaxy originally was 50 to 200 times more massive than it is now, and the mass of its black hole relative to the original mass of the galaxy would be more like that of the Milky Way and many other galaxies. The stripping could have taken place long ago and M60-UCD1 may have been stalled at its current size for several billion years. Simply a daughter of the larger elliptical parent, ejected long ago as a dense cluster that has grown from within over time. Simple really. No need for complex collision and stripping concoctions. Ah, but the astronomers' mind is best when it is boggled. @Tuxford - since we can see trails of star ripped from nearby small galaxies by bigger galaxies, and since there is indeed a big galaxy near this dwarf galaxy, the explanation that the article proposes seems simple enough. And that the metallicity of the starts matches a larger galaxy instead of being typical of dwarf galaxies bolsters the case. In contrast no evidence has been seen of smaller galaxies being ejected from larger ones, and a force that causes an entire dwarf galaxy to overcome the gravitational force of a massive elliptical galaxy, without destroying the dwarf, would require new physics and is thus a much more complex explanation than the what the article proposes. Core mother stars come first. And they lead the growth. And they grow faster than the host, and not due to tidal stripping. And they eject a lot of likely new material. A likely early stage ejection. More in my comments here. FIXING the missing links above. More references in my comments here.